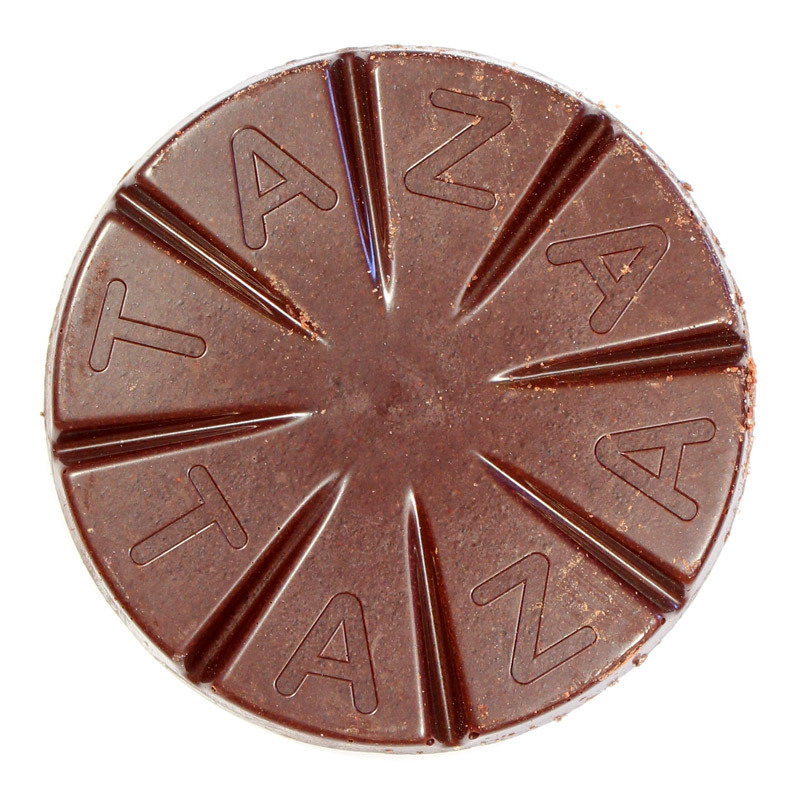 The minimal processing involved in creating Taza’s stone-ground chocolate gives a finished product with a satisfyingly coarse, almost biscuity texture and a sweet flavour that lets you taste the bold flavours of the cocoa, sugar and spices individually. We love this cinnamon, 50% dark version for its gently warming flavour that always leaves us wanting more. This is a particular favourite on a cold winter’s evening. Here’s a chocolate that may be a little different from anything you’ve tried before. For Massachusetts-based Taza, when it comes to making chocolate, doing less brings more when it comes to allowing the complex flavours of cacao to shine. Their style of craft chocolate is much closer to the kind of chocolate you might have found 150 years ago, still popular today in Mexico and some parts of South America. 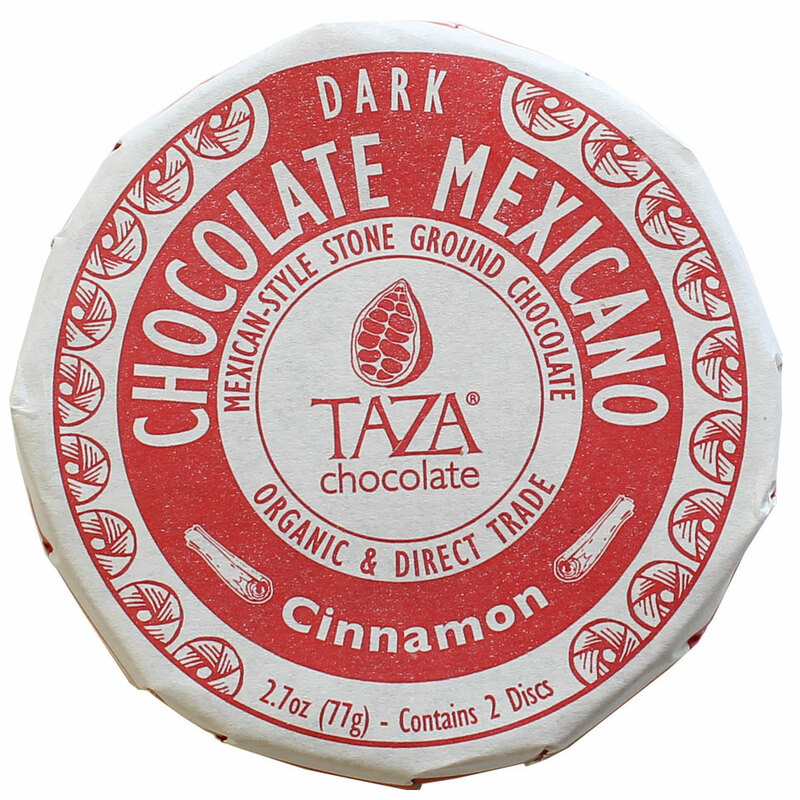 This is because Taza prides itself on being stone ground and unrefined; whilst many chocolate makers spend days on end refining and conching their products until smooth, Taza simply grinds its organic cocoa beans with cane sugar and spice in a traditional Mexican stone mill called a molino. Taza is proof that chocolate can change lives, producing its stone-ground chocolate using the very same traditional techniques that inspired its founder Alex Whitmore (one of Zip Car’s earliest employees) to become an apprentice to an authentic molinero whilst on holiday in Oaxaca. But it also transforms the lives of the cacao producers that it works with, buying from farmers directly in a Direct Trade model that enables farmers to receive a price above even Fair Trade levels. Taza truly is chocolate with a conscience. Organic cocoa beans, organic cane sugar, organic cinnamon. May contain traces of tree nuts and / or peanuts. I loved this! Gritty and so unique. Really really nice. I absolutely loved the crumbly, crunchy texture of this chocolate but unfortunately was not keen on the cinnamon flavour. However, I'm now keen to try some other unrefined chocolate varieties based on texture alone. I like chocolate and cinnamon but for me this bar didn't really work. The cinnamon flavour was too strong and I didn't like the grittiness either. We've been rating our bars on our regular deliveries for the past 6 months now, this bar scored a 6/10, which on the face of it makes it sound very average, yet it was anything but: The texture is more akin to kendal mintcake, by some distance the most coarse bar of chocolate I've ever had, and the cinnamon element was welcome too. The lowness of the mark more reflects how it rates as a bar of chocolate, which in my mind it barely qualifies as, it's another thing completely. Worth a try just to make your own mind up. Loved this chocolate, especially the raw grittiness. definitely will buy more. The cinnamon flavor was more powerful that I'd like it to be, and I'm not a fan of the grittiness - but stone grinding does give it an interesting texture, However, the chocolate itself was bland and the most prominent flavor in the whole thing was the cane sugar. Has to be a bottom-score for me. I attended a tasting session run by Cocoa Runners, and Spencer, the founder, was honest enough to say this can be a Marmite bar. But for me it was delicious, as someone else in the session commented it 'tastes like Christmas' with its Cinnamon flavouring. I had never had unrefined chocolate before, and I admit the first bite was a shock to the system, but I really do like it and will have to try the rest of the range. I highly recommend this bar, just be prepared for something different. Then again I love Marmite! This one got donated to the man in the house. It was awful...but I have tasted it before as a friend from the US sent me some, so I should have been prepared. Perhaps it is designed for Americans' taste, which is inured by candy. This chocolate is basic. It lacks finish. It lacks smell. It lacks body, in spite of being raw. It is too sugary. It is far too gritty. And the cinnamon is an unpleasant and unnecessary addition. Cacao is such a fantastic thing that its own flavours are those which should count, not any embellishments. Even my Man, who'll usually polish off everything I reject, couldn't face this one. He'll give it one last go in a mug as a drink. but I doubt it'll make it into my tummy again. I've tasted a lot of chocolate in my life, and this is has to be one of the most original and unique bars I've ever had. What a great texture and the cinnamon flavour definitely cuts through! So sickly and sugary, I could not eat even one piece and had to find something to take the taste away. Bleurgh! If crunchy sugar mice flavoured with cocoa and cinnamon is your thing, then this is for you, if you are looking for chocolate, then look elsewhere; it is not chocolate. Taza chocolate is most definitely not for me, thanks, but no thanks. tried this and whilst it's ok, its gritty. Dont mind gritty but it leaves an after taste. Enjoyed that it was dark but that was it. Didnt like this one. This does kind of feel like eating sand in terms of texture, but it tastes wonderful. Perhaps because I add cinnamon to half the food I eat I don't find it that strong, but soft and sweet tones of it, tastes a bit like cola. Loved it, as the others said this is a more gritty bar, its texture is almost like sugar in some respects. I personally loved it, the cinnamon/chocolate mix worked well together and didn't feel overwhelming at all. Not to my taste at all. Gritty, and as other reviewers have said, the chocolate has a distinctly medicinal taste. Update to previous review, I tried making hot chocolate out of it. And while it calmed the medicinal cinnamon flavour It lost the chocolate flavour entirely. This is actively unpleasant to eat as a solid chocolate and pointless as a hot chocolate. As a solid tasting chocolate this is not ever going to be a favourite. I will take the pack's suggestion of using it to make a hot chocolate as well. Flavourwise the cinnamon is overwhelming, almost to the point of being medicinal. And there is a distinct Chilli heat to the bar, which despite my love of ridiculously hot chili sauces made my mouth burn. The chocolate is also very very sweet much more than one would expect from a dark chocolate (even only 50%). Testure wise, gritty with a powdery finish. doesn't melt consistantly on the tongue.